Born at the old Mercy Hospital in downtown Laredo with a birth injury on his right side, Foster had to compensate with his left arm and leg, nevertheless he never let it hold him back. Jack attended Laredo’s schools, graduating from Martin High in 1960 and Texas A&M University in 1972. He married the love his life, Millie in 1991 and commenced to build a career in professional tennis. He was a competitive tournament tennis player until being diagnosed in the mid 1990’s with a genetic disease known as Alpha -1 Antitrypsin Deficiency. Aiad causes emphysema (not from smoking). He now has less than 50% lung capacity than normal for his age. He is also a bladder cancer survivor. His last tournament was in the men’s 55’s, some 25 years ago. 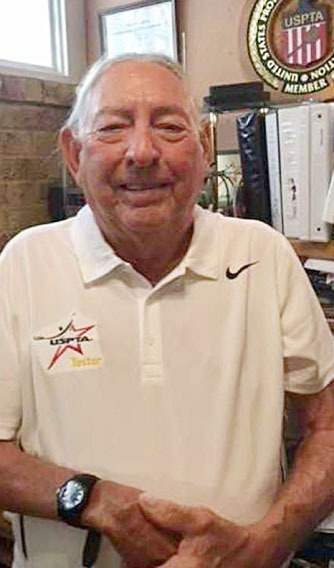 In his long and impressive career, Jack has served as a head professional and director of tennis at two locations in the Houston area. He is presently Director of Tennis of Tennis for FCCA, a subdivision of Sugarland, Texas a tester for potential teaching pros and serves on committees for various organizations, as well as on their head advisory staffs. Foster still remains an active on-court teaching professional. In this capacity, he has dedicated many years to teaching stroke survivors, wheelchair players (USPTA Wheelchair certified), amputee players, autistic children and physically disabled children. He is a certified USPTA (United States Professional Tennis Association) Professional since 1991, designated a master tennis professional in 2016 (Less than 1% of USPTA professionals out of a total of 15,000 members have achieved that designation), certification tester since 2006, National Star Award Recipient 2005, Texas Division Tester of the Year 2010 and 2012, and George Basco National tester of the Year 2013.A member of PTR (Professional Tennis Registry) since 1996, achieving professional status in 3 pathways, adult, junior and high performance tennis. The organization committees are USTA Adaptive tennis, nominating committee and PTR Education Committees. He has served on USPTA National Committees for Education, Conference Awards and Diversity Inclusion Committees, as well as their Texas Board of Directors from 2007-2008 and conference chariman for 6 years. He has been published in professional magazines and newspapers, including the Tennis magazine, USPTA Texas Monthly Advantage Magazine, USPTA Texas Monthly, The Texas Magazine, The USPTA Southwest Division Magazine and many articles and tips on tennis in the Old Houston Post newspaper.